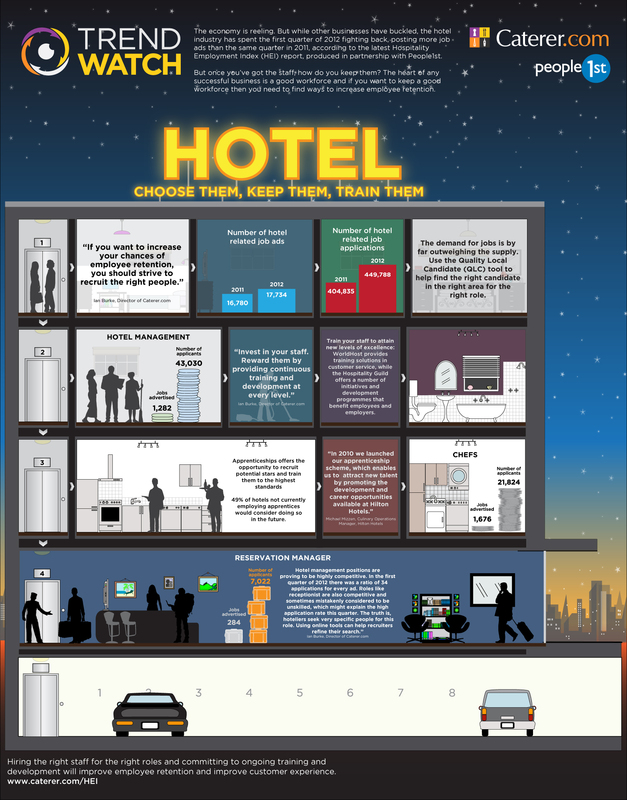 Commissioned by People1st, in partnership with Caterer.com, this newly published infographic examines the key trends affecting the hospitality industry, utalising statistics from the Hospitality Employment Index. The UK’s descent into a double-dip recession in the first quarter of 2012 put a furrow on the brow of many business leaders across the hospitality industry. While most sectors were left reeling though, hoteliers were able to breathe a partial sigh of relief, according to the Hospitality Employment Index (HEI) report Q1 2012. But even though the HEI indicated that hotel job ads were up compared to the first quarter of 2011, there were strong indications that businesses need to invest in their future by finding ways of increasing employee retention. Take a look at this IHG video, with their Chief Financial Officer Tom Singer commenting on the key highlights of the latest financial results, published this week. for the US and upscale brand for China. You may remember I posted not so long ago about the Travel Distribution Summit, which was held in London this June. I attended the event and wanted to share with all those who couldn’t make it, my thoughts and opinions,share some insight’s into what was discussed and the latest trends we all came away with as well as my own personal highlights. If you remember, there was a huge list of speakers, so planning your time is critical to ensure you get the most out of the event. All kinds of topics were covered, from social media and online marketing, to revenue management, to mobile technology, so there was a wide range in industry experts giving their thoughts (and a little self promotion along the way!). For those who have not attended in previous years, the Travel Distribution summit is held annually at the Business Design Centre in London. It’s made up of a mixture of supplier stands and several conference/seminar rooms where you can attend to hear from industry leaders and people with something new to say about the given topics. These are wide-ranging – some are free, some you have to pay for (whilst on the topic, I do feel that the admission price is a little steep – but it is a great event) and of course, it’s a great place to network with colleagues from the travel industry. I actually felt there was quite a big presence from the hospitality industry this year, both in terms of speakers and attendees which was great to see. As for highlights, two sessions stood out for me. The first was to finally watch Josiah Mackenzie present live. I’ve followed Josiah’s passionate work in hotel social media and online marketing for a number of years, and he really knows his stuff. What you find so often at events such as this are speakers who have been brought in because of their job title, rather than ability to present and relevent content to provide. Josiah’s passion for what he does shines through and the whole room was gripped, intently listening to what he was telling us. The second highlight was a debate that saw Naveen Selvadurai, Co-Founder of Foursquare, Dave Scheine, Director of European Operations at Yelp and Andy Ellwood, Director of Business Development, Gowalla. A very impressive list! In particular, I really enjoyed hearing from Naveen, explaining how Foursquare came about, how it’s changed and what makes its model very different from other competitors. I also found it humours to see that people tweets were appearing on the screen behind the stage, with the same one popping up time and time again “I bet you guys were really pissed when Facebook Places launched”. I should probably also give a mention to the Keynote Debate on customer Tech and Trends, called, “How will your customers interact with you through and beyond 2011”. Taking part in this debate was Romain Roulleau, SVP e-Commerce at Accor Hotels, Danny Barrasso, Senior Director of e-Commerce at Hilton and Alun Williams, e-Commerce director at TUI. Very interesting topics covered here, including each mobile strategy and mobile web strategy. I particularly liked Romain’s presentation of what Accor have done, what didn’t work so well and plans for the future. Accor time and time again show their belief in investing in as many channels as possible and drive this forward year in year out. My only negative point was probably the fact that some of the smaller conferences taking place lacked relevent content. I don’t really appreciate someone telling me that social media is still unproven, and that experts should be brought in to manage it. Come on. Please. You could have said that 10 years ago. Today’s different (I’m naming no names!). Thanks to everyone involved with Travel Distribution Summit 2011, it was a great couple of days, and looking forward to next time. Back in January, Starwood Hotels & Resorts announced their intention to open a substantial number of new hotels during 2011. Speaking at the American Lodging Investment Summit (ALIS) in San Diego, Starwood announced that it expects to open another 70-80 high quality new-build and conversion hotels in 2011, coming off of the 72 opened and 96 new deals signed in 2010. Propelled by unprecedented demand for hotels in the world’s fastest growing markets, Starwood, the world’s most global hotel company, will open nearly 70% of its new hotels outside North America, with the majority in Asia Pacific – seen as Starwood’s biggest growth market. Starwood is also widening its lead as the largest operator of luxury and upper upscale hotels in the world. Of the new hotels Starwood is opening this year, 60% will be in the luxury and upper upscale segment, including six St. Regis hotels and two Luxury Collection properties. This year, Starwood will also open its 100th hotel under its St. Regis and Luxury Collection brands. India has also seen an acceleration in demand – a country where Starwood are already the largest five-star hotel operator. Starwood plans to grow its existing portfolio of 30 hotels in India by 40% in the next two years. Growth for Starwood’s high-caliber brands is also picking up in Thailand, where it will add four Starwood hotels to its portfolio this year, including two Four Points by Sheraton hotels, an Aloft hotel and The St. Regis Bangkok. Starwood is also growing its footprint in Malaysia, with two Four Points by Sheraton hotels scheduled to open in 2011. Impressive growth I am sure you will agree, and certainly following the patterns we see globally in terms of the biggest growth markets for hotels. It’s important to remember that half of Starwood’s current portfolio is located in North America, so expansion is key in other areas to remain a strong global player. In North America though, another 20 new hotels will be added in 2011 to ensure the strong demand for the company’s brands are met in the home market. In July we saw the announcement that Premier Inn hotel content would be made available through the Amadeus GDS, predominantly to attract inbound guests from outside the UK to its properties. Today, we can see that Premier Inn are expanding their business model in Qatar after signing a joint venture agreement with Dohaland Hospitality. Currently, both parties plan to invest in building a brand new hotel in Doha Education City. Premier Inn (Whitbread) are really expanding fast. More and more hotels are opening in the UK & Ireland and they now have something close to 600 properties in their portfolio, making them the largest UK hotel chain. They also have an overseas hotel in Dubai – the success of which has obviously made them take further steps to expand in the region by signing this joint venture agreement with Dohaland Hospitality. This growth is not just a focus in building more hotels and restaurants – it seems to be an all round focus, looking at distribution and growing sales to support their expansion. Distributing their content on a GDS makes good sense – what better way to position your prices and availability with every other leading player and grow your name outside of the UK? Surely this will not just happen with Amadeus GDS, but Travelport and Sabre too. When Premier Inn hit the market, many wondered how they would overtake the other budget players in the market, especially Travelodge. But quickly, they have built a reputation on good value for money, and a name you can trust. And at exactly the right time. I don’t think there is another hotel chain, certainly in the UK, that has benefited from the global economic climate. Corporate travellers switching from four and five star hotels to mid-scale “budget” properties has no doubt helped Premier Inn become a firm favorite, especially with TMCs. We all know that social media is playing a stronger and stronger role in the hotel industry. More and more hotels are getting involved with Facebook, Twitter and the like, but how are guests taking advantage of this social media revolution? One viewpoint which I am hearing more and more frequently is that travellers are posting their complaints and negative comments onto Twitter as quickly as possible, in the hope that the hotel responds quickly. After all, I’d prefer a free room upgrade now, rather than complaining post stay and seeing what I get. But is this really happening out there right now and are guests rewarded by doing this? It’s true that negative press in social media can affect a hotel directly and with big impact (I’m thinking of TripAdvisor of course), and they need to carefully manage this. You will see just by looking at TripAdvisor that there are now so many property managers responding to comments and thanking those that are good, that this is clearly one channel that hotel managers watch carefully. So how does this kind of complaint work? I am sure that the majority of hotels are not monitoring the web 24/7 for any snippet of feedback that may appear. In fact, I am sure that it’s the complaint maker who shows the hotel what they are doing, and want the hotel to respond accordingly. I’d love to hear from hoteliers as to their experiences with this kind of feedback and use of social media, so please leave comments. I am sure though that the benefits of social media are still far outweighing that of the negative press that it sometimes attracts.